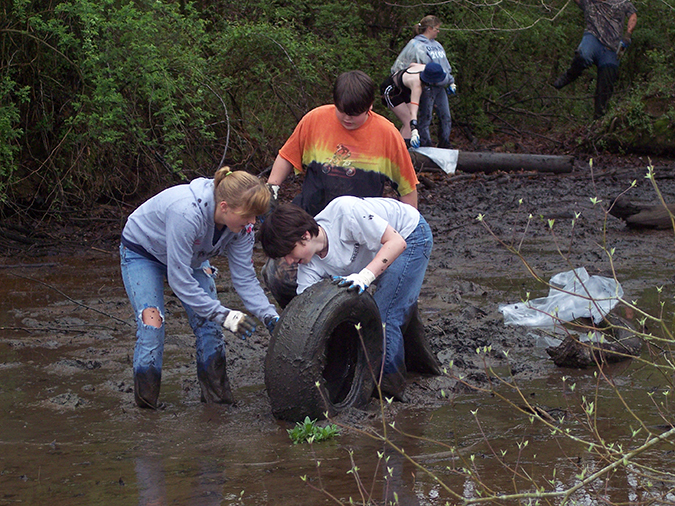 Ijams River Rescue volunteers clean trash from the river; image submitted. Sign up to volunteer for the 30th Ijams River Rescue and you’ll have some good “clean” fun on Saturday, April 6, from 10 a.m. to 2 p.m. Presented by TVA with support from Lowe’s, Ijams Nature Center’s annual community-wide event focuses on removing trash and tires from sites along the Tennessee River and its creek tributaries from the river’s headwaters in Knoxville to the shores of Loudon County. The 30th annual Ijams River Rescue presented by TVA with support from Lowe’s is sponsored by City of Knoxville Stormwater Management, Keep the Tennessee River Beautiful, Dow, First Tennessee Foundation, Grayson Subaru, Tennessee Wildlife Resources Agency, Thompson Engineering, WestRock CP, LLC, WUTK 90.3 The Rock, American Rivers, AmeriCorps, Knoxville TVA Employees Credit Union, Waste Connections, and the Water Quality Forum. Ijams Nature Center is a nonprofit, 315-acre educational nature center for all ages, abilities and walks of life. Ijams’ mission is to encourage stewardship of the natural world by providing an urban green-space for people to learn about and enjoy the outdoors through engaging experiences. Located just three miles from downtown Knoxville, Ijams features 12 miles of hiking and mixed-use trails, a public access river dock, swimming, boating, biking and more. The center offers hundreds of educational programs annually, from day camps and school field trips to outdoor and classroom education programs on beginner birding and hiking to wildflower walks and family adventures. The Ijams grounds and trails are open every day from 8 a.m. until dusk. The Visitor Center is open Monday through Saturday 9 a.m. to 5 p.m. and Sunday 11 a.m. to 5 p.m. For more information, visit Ijams.org or call 865-577-4717.